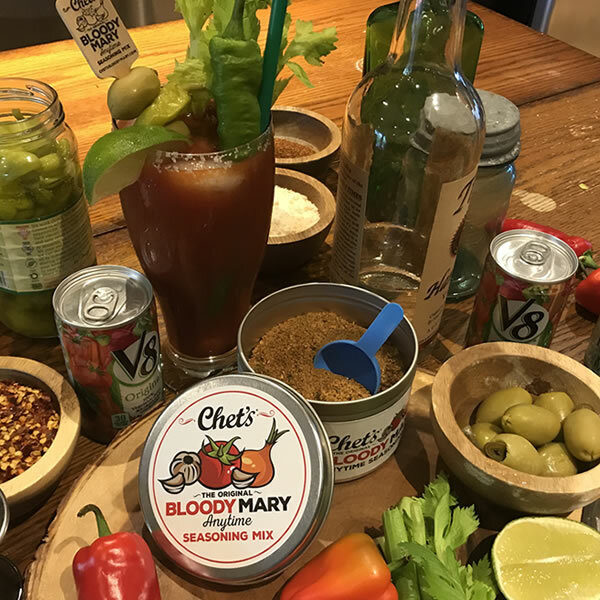 With Chet’s Anytime Bloody Mary Seasoning Mix Bulk Tin, you can now make one or as many Bloody Marys as you like. Each convenient tin contains 4 oz. of Bloody Mary Seasoning Mix good for making 20 Bloody Marys. Simply open the tin, use 1 scoop as provided and add to your favorite tomato juice and vodka and you are done. How simple. You can make an individual Bloody Mary or as many as you like at home. Like it less spicy? Add less mix. Like it more spicy? Add more. Make it the way you like. Add it to Tomato juice, V-8® or Clamato® juice – Now you get to choose. The non-perishable mix will last the same as any other spice you already have. Replace the tin lid and store in a cool dry spot. The easiest and simplest way to make a great tasting Bloody Mary.